We had a nice bit of Fall weather in September, before the Indian Summer fell upon us and made the apartment unfit for cooking. While it was still cold enough to use the oven, I did some side dish experimentation, and made this truly delicious casserole to accompany pork chops. 3 Leeks (white and light green portion only), thinly sliced into half moons and rinsed of all dirt. I adapted this from a recipe in Everyday Food. I omitted the celery and changed up the cheese including decreasing its amount, and bumped up the amount of leeks. Preheat oven to 425. Brush 1 1/2 quart baking dish with olive oil and set aside. In large skillet, heat olive oil over medium heat; add leeks. Cook 8-10 minutes until softened. Add artichokes, broth and cheese, and stir until combined. Remove skillet form heat, add lemon juice and season with salt and pepper. 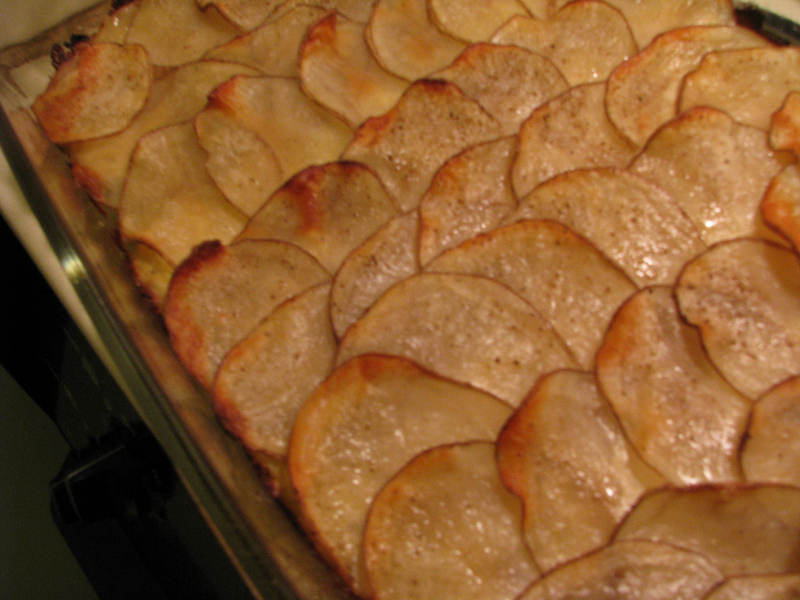 Arrange half the potato slices in overlapping rows to act as the base for your casserole. Season with salt and pepper. Top with the artichoke mixture, making sure to evenly spread it out across the potato slices. Layer with remaining potatoes. Mist with olive oil and salt and pepper. Bake 40-45 minutes until mixture is bubbly and edges of potatoes are crispy and golden in color. Let stand about 10 minutes before serving. The leftovers from this made a great addition to my lunch as well. Reheated for 2 minutes in the microwave at work.